Over the past 2 weekends, we have been slowly painting our kitchen cabinets. 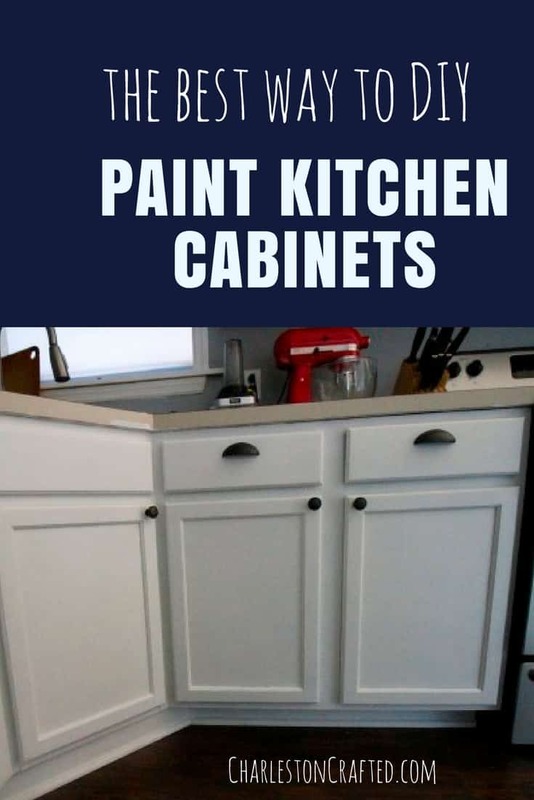 As you know, painting old cabinets that are in good shape is a great way to save money compared to buying all new cabinets. There was nothing wrong with ours and we liked the existing layout enough (with the addition of a pull out trashcan and an open shelving unit) that painting was perfect for us. 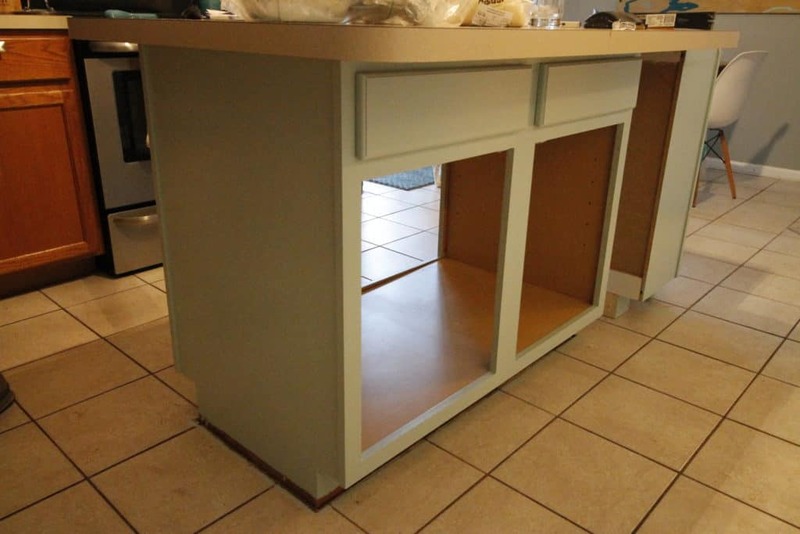 Here’s how we painted the cabinets and some lessons that we learned along the way. We actually painted our bathroom vanities last fall as a test for this project. We wanted to see how hard it was to do and how durable that finish was. 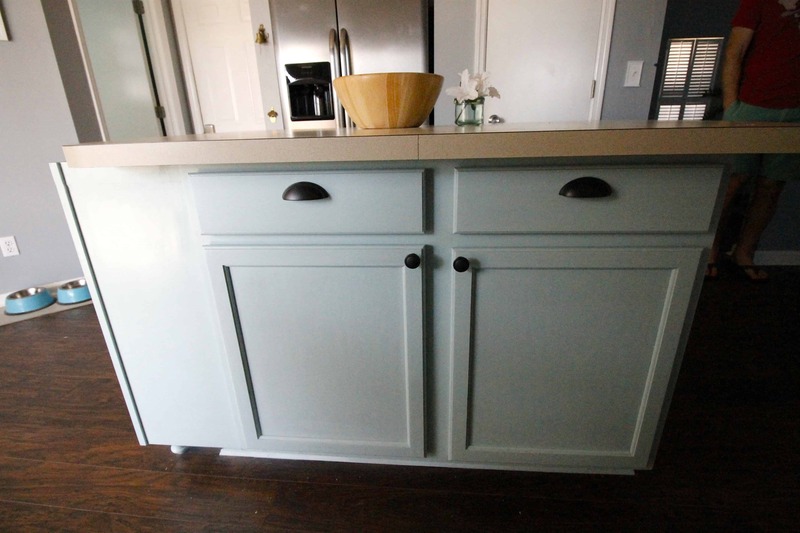 Like then, we used Valspar Cabinet Enamel paint. We were pleased with the painting process and also how they held up, so we used the exact same method for these cabinets. To prep, we unscrewed all hardware and removed the doors and hinges. I then used the Orbit Sander on each door and on the box of the cabinets. The goal of sanding is to remove the glossy protective finish and make it easier for paint to stick. After sanding, be sure to wipe everything down with a rag. The next step was to paint. I love using a high density foam mini roller for the smoothest possible finish. 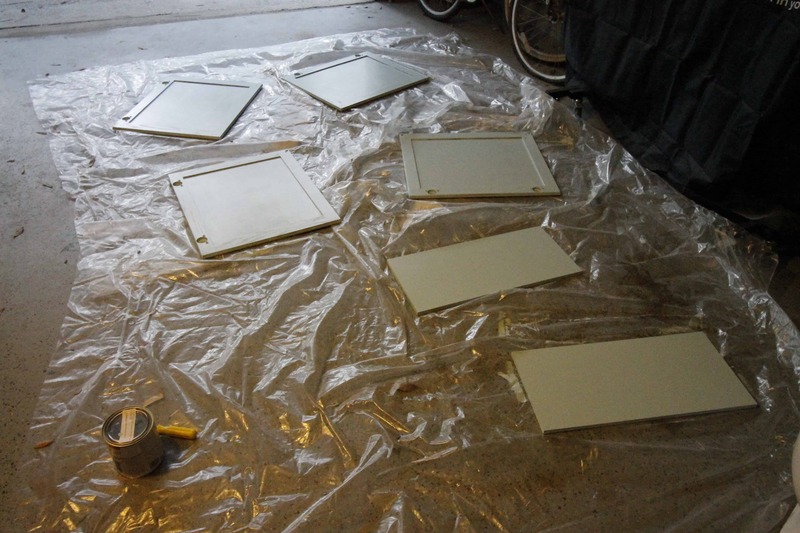 The thing with this paint is that it takes a lot of coats – it took me 6 to be exact. But, it was worth it for the smooth finish in the end. Our island is Sherwin Williams Watery (like our front door) and the rest of the cabinets were white color matched to our trim. My life tip that Sean never wants to follow: always buy more paint than you think that you need. A quart is almost never enough for anything. Ahem. We used 1 quart of Watery (like, every drop) and almost 2 quarts of the white (should have got a gallon). The hardware is also via Amazon. Shocker! I got these door knobs and these drawer pulls. I actually asked for them for Christmas because I am that much of a nerd, but I love that they come in 10 packs for economical reasons and because we now have a few spare that we can use on furniture around the house to tie the spaces together. So far, how am I feeling about it? A big part of me wishes that I had painted them all Watery. I love love love the color and just think that it is so me. However, I know that our countertops and our backsplash will bring in a lot more color – so I will reserve judgement until those are in place. And if I still want Watery then, I’ll just take them off the hinges and do it again. Here are our tips for organizing kitchen cabinets! 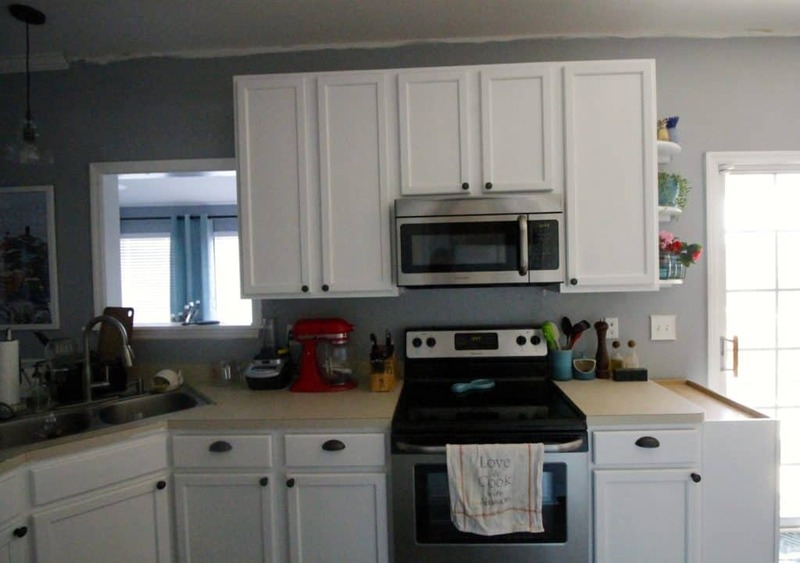 Have you painted your cabinets? How did you like the results? 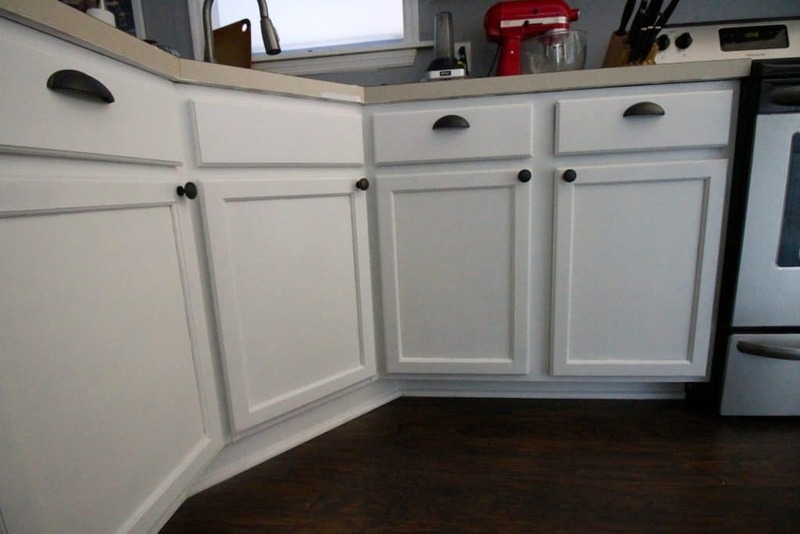 Did you clean cabinets before sanding? We’ve heard both yes and no to this. We are actually taking ours out and painting then redoing the layout. 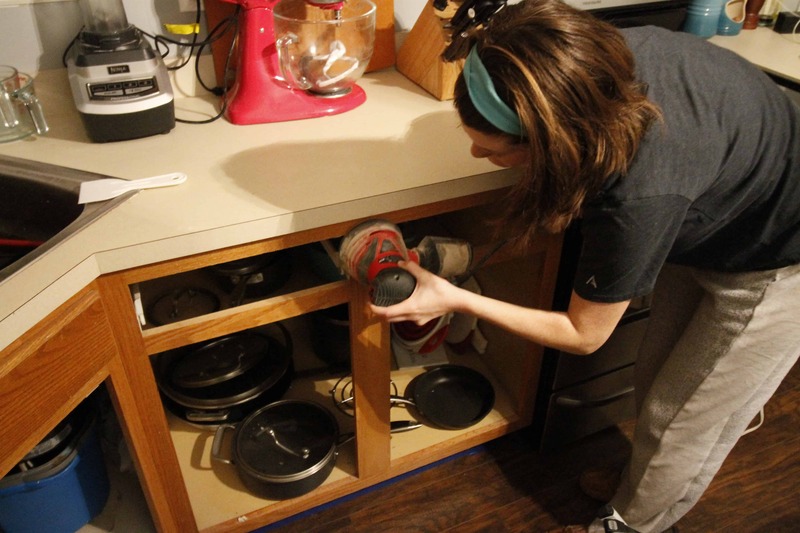 We tried our bathroom cabinet with deglosser then painting and the results were not great. So with the kitchen we will do sanding instead of deglosser. 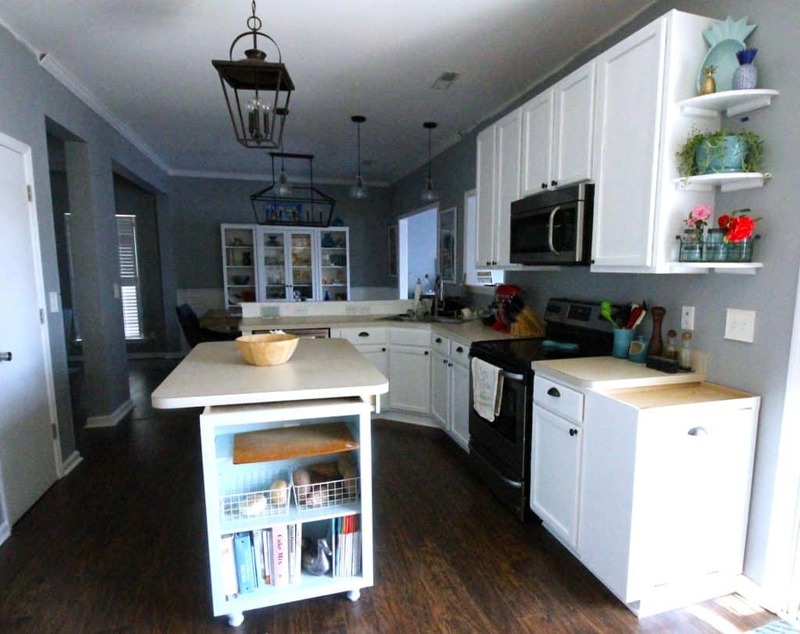 I’m torn between safe white cabinets and doing a slate blue -grey…resale value says white over color. we did not clean them before sanding but did wipe them down after sanding! 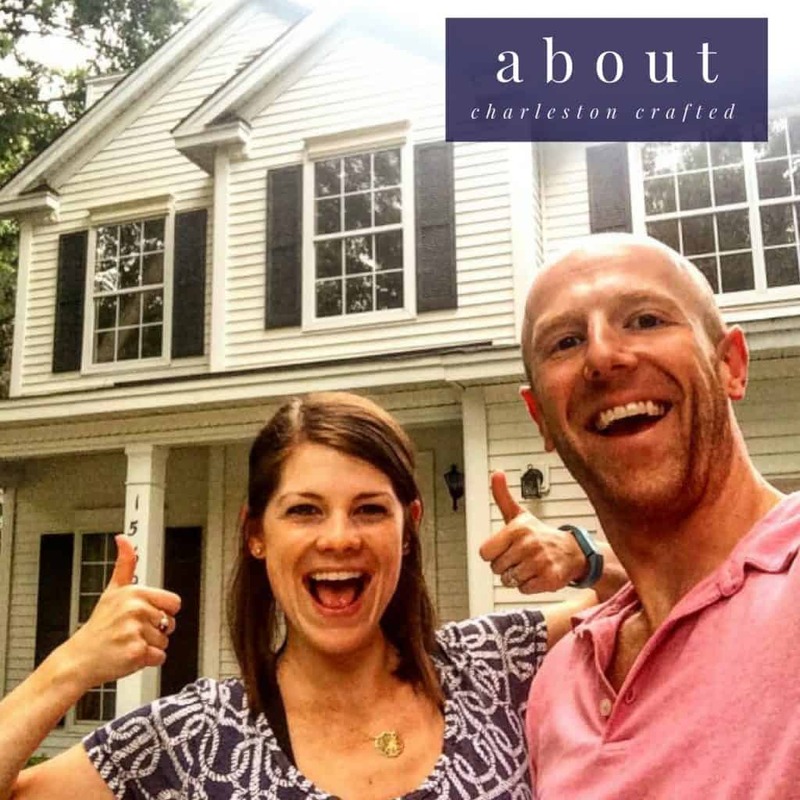 if you don’t plan on selling soon, do what makes you happiest. it would be no big deal to paint it white before selling. design your house for you! I LOVE your kitchen remodel! Thank you for the inspiration, you did an amazing job! So glad I found you on Pinterest, I will be following you because we have the same style & taste. We recently bought a house and the kitchen looks just like your “before”. We are about to paint our walls & cabinets, but I’m having a hard time choosing the right white for cabinets and grey for walls that look as beautiful at night as during the day. What colors/brand did you use? 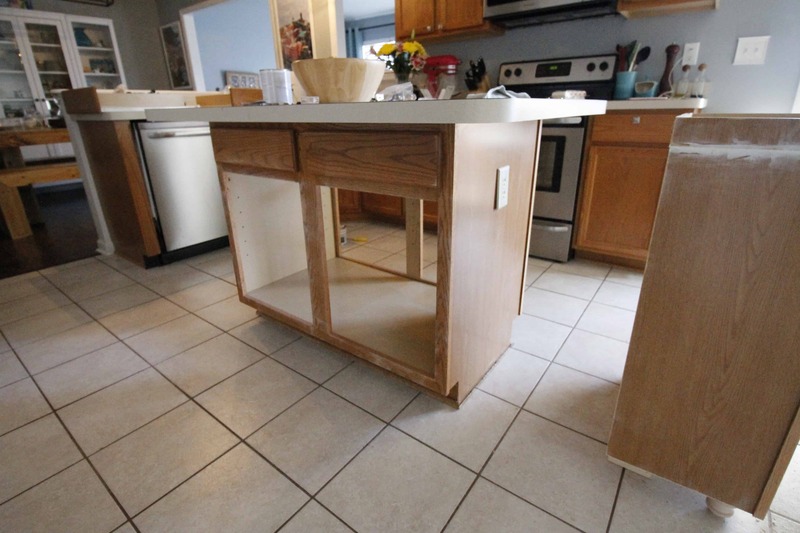 Are the cabinets easy to wipe clean and are you still happy with they’ve help up? 2. buy samples on that color. paint on several walls. some next to trim, cabinets, floors, in different lighting etc. Look at the in different lighting, 3x a day for several days. Wait at least a week. pick from there! Our walls are Sherwin Williams Online grey. I love that it is a nice cool grey. It has held up really well and we still love it! !